The 13 Access Validating Agencies (AVAs) across England and Wales joined together to sponsor and support this event for the third year running, in memory of a much-loved colleague, Keith Fletcher, who worked tirelessly promoting Access throughout his career. Kath Dentith, Head of Access, QAA, praised the four winners reminding them that they were part of a year group of 25,000 Access learners nationwide and they should be proud of their achievements. She said Access to HE is a qualification that QAA are honoured to be involved with and they recognise the commitment displayed by all Access learners. Nominators for each of the winners and runners-up spoke emotionally of their nominee’s journey through Access and why they had nominated them. They were then presented with a certificate and cheque (£800 for each winner and £500 for the runners-up) by Nic Dakin, MP. Nic is a keen supporter of adult education having previously been Principal of John Leggott College, Scunthorpe. 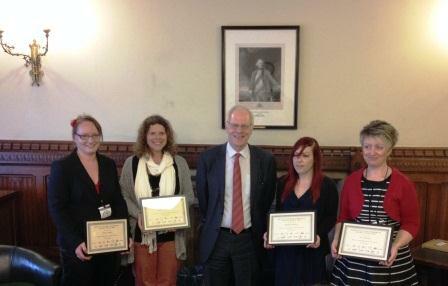 Award winners with Nic Dakin MP who presented the certificates. Jane said she had admired T’s determination, this was a student who had gone from requiring constant support to standing up and delivering presentations to her fellow students, an indication of how far she had come. This was the first time ‘T’ had visited London and she couldn’t have imagined doing that before. During her time at K College ‘T’ produced truly outstanding work and she has carried this commitment onto her studies at The University of Kent. Jeremy observed that Access Diplomas open the doors for new opportunities and stressed how important it is that we give people an opportunity to shine. Trina started low on self-esteem and was very nervous, Jeremy admitted that to begin with he didn’t believe she would last the course, but she proved him wrong and flourished in her learning. Her attendance was exemplary despite living around 10-12 miles from college, having two young children and a husband in the forces, she still managed to attend all her sessions. Trina is now studying mental health nursing at Swansea University. Heather said Rowan provided an example not only to her own children but to other Access students. Rowan had studied a degree in business around 20 years ago, but after raising a family had decided to change direction and wanted work in healthcare, specifically occupational health. She learned that age was not the barrier she had anticipated and that university was still open to her. Heather praised Rowan’s talents in all areas of completing her course and this was recognised by the fact she was offered places on every degree course she had applied for. Rowan is currently studying occupational therapy at University of Southampton. Jane said that even the day before the presentation; Zoe couldn’t believe she had won the award. However, from the beginning of the course it was apparent to Jane that Zoe had something special, with a passion and drive for learning. Zoe completed all the work required to achieve the Access to HE Diploma and continued to study, taking on additional work throughout the year, achieving all her credits at Distinction. Jane said, as her tutor when marking she would always put Zoe’s assignments at the bottom of the pile to mark last so she could finish on a high! Zoe is now studying biomedical science at University of Lincoln. Laser Learning Awards coordinated the judging and presentation event on behalf of all the AVAs and would like to thank Nic Dakin, MP and Kath Dentith, QAA for presenting, along with special thanks to the judges who had the hard task of choosing between all the nominated candidates. Nominations will be open for 2013/14 in the summer term and if you would like further information, please contact your local AVA.